International Artist takes you inside the studios of the world's best artists. 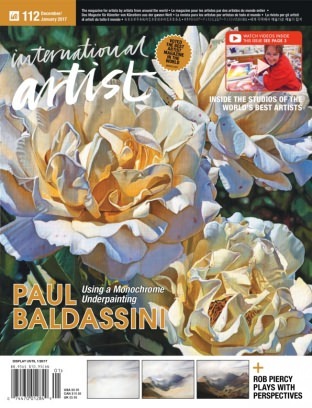 This bi-monthly magazine, which displays practicing artists describing their approach and work process in all painting mediums, is priced at $17.99 (USD) for an annual subscription on Magzter. American Art Collector is a unique monthly magazine specially designed to bring living representational artists, galleries and active art collectors together in one place. This monthly magazine is priced at $19.99 (USD) for an annual subscription on Magzter. American Fine Art Magazine is the first publication to offer complete and comprehensive coverage of the upcoming shows, auctions and events of this market so deeply tied to American history, society and culture. This bi-monthly magazine is priced at $16.99 (USD) for an annual subscription on Magzter. Native American Art Magazine publishes previews of upcoming shows, auctions, fairs, markets, exhibitions and events. This bi-monthly magazine is priced at $19.99 (USD) for an annual subscription on Magzter. Western Art Collector is the premier magazine for collectors searching for works by talented living and past artists who depict the West in paintings and sculptures. This monthly magazine is priced at $19.99 (USD) for an annual subscription on Magzter. "We're extremely delighted to take the renowned magazines of International Artist Publishing in digital format all over the world. We're quite confident that the reach of these artistically profound magazines from the USA will exponentially increase on our world-class platform." - Girish Ramdas, CEO, Magzter Inc.
"International Artist Publishing's magazines comprehensively cover everything that an artist needs - from the best art galleries around the world to inspiring interviews of leading artists. Here's to a fruitful digital publishing partnership between International Artist Publishing and Magzter." - Vijay Radhakrishnan, President, Magzter Inc.
Magzter - Digital Magazine Newsstand 6.10 is free (with in-app purchases) and available worldwide through the App Store in the News category. All the magazines from International Artist Publishing also come as a treat to Magzter GOLD users, who can enjoy reading them along with 4,000+ other international digital magazines. The Magzter app is also available on the web, Google Play, Amazon App Store, Kindle Fire and is expanding to more platforms soon. Magzter's easy purchase and renewal systems ensure subscriptions are paid on time, eliminating the need for paper checks and postal mail issues. Users can buy their magazines on any of the above devices/platforms and seamlessly port their purchases to any other devices, a feature unique to Magzter. Magzter is the world's largest and fastest growing global digital magazine newsstand with over 30 million digital consumers, more than 8,500 magazines from over 3,500 publishers. Headquartered in New York, Magzter has its local offices in London, Barcelona, Amsterdam, Mexico City, Cape Town, Chennai, Singapore and Tokyo and will soon be expanding to other countries. Founded by global entrepreneurs, Girish Ramdas and Vijay Radhakrishnan in June 2011, Magzter enables magazine publishers around the world to create and deliver digital editions of their titles to global consumers. Powered by its proprietary OREY Click Publishing System(R), Magzter also enables their customers to publish interactive/audio-visual content in the magazine as it supports HTML5. Magzter launched Magzter GOLD subscription service to give digital readers unlimited access to thousands of magazines for a low monthly price. All Material and Software (C) Copyright 2016 Magzter Inc. All Rights Reserved. Apple, the Apple logo, iPhone, iPod and iPad are registered trademarks of Apple Inc. in the U.S. and/or other countries. Other trademarks and registered trademarks may be the property of their respective owners. There are 12506 Members. Register today!